Osteolysis, which is considered to be a major source of morbidity following total hip joint replacement, has been notoriously difficult to measure accurately, particularly in the acetabular area. In order to study periacetabular osteolysis, specialized software for computerized tomography (CT) scan image analysis has been developed. This software (3D-CT) eliminates metal artifacts, allows three-dimensional segmentation of the CT image, and reconstructs the segmented image to provide an accurate representation and measurement of volume for osteolytic lesions. In the present study, 20 patients underwent periacetabular osteolytic volume determination using 3D-CT, functional assessment (using the Harris Hip Scale, the Western Ontario and McMaster University Osteoarthritis Index, and the short form 36 questionnaire), and two-dimensional analysis of volumetic polyethylene wear using digitalized plain films. Periacetabular osteolysis correlated directly with the polyethylene wear rate (relative risk [RR] = 0.494, P = 0.027). If one patient with an acetabular revision, one patient with recurrent dislocation, and one patient with a Biomet prosthesis are excluded, then the correlation between wear and osteolysis is improved (RR = 0.685, P = 0.002). In summary, the current study demonstrates both the feasibility of CT imaging of periacetabular osteolysis and the correlation between polyethylene wear and osteolytic volume, providing a potential outcome measure for clinical trials that are designed to examine interventions in this complex disease process. Total hip arthroplasty (THA) has been one of the most successful advances in orthopedic surgery in the twentieth century, relieving pain, improving function and markedly improving quality of life for patients with end-stage hip disease. It has been estimated that there are more than 1.5 million THAs performed each year and this number will continue to grow as the population ages. One of the major long-term complications of THA is periprosthetic osteolysis, which frequently progresses to failure of fixation. This process, known as aseptic loosening, is the primary reason for revision of THA. The prevalence of periprosthetic osteolysis around the THA at 10 years after implantation ranges from 5 to 20% in recent large series [1,2,3]. At present there are no guidelines to the degree of osteolysis requiring revision surgery, which constitutes a serious problem in the management of patients with aseptic loosening. Several groups have postulated that wear-debris-induced osteolysis is the major cause of prosthetic implant failure [4,5,6,7]. It is hypothesized that wear debris generated from the prosthesis is phagocytosed by macrophages, which then initiate an inflammatory response. This leads to the recruitment of activated osteoclasts, which cause osteolysis at the bone-implant interface. Animal models have been developed, both to study this process, and to evaluate potential interventions [8,9,10,11]. In these experimental models, quantitative analysis of histologic parameters provides direct measurement of osteolysis. These techniques, however, are not applicable to human investigations. Although radiologic analysis is a direct measure, the current methodology is insensitive and subject to operator error. Furthermore, plain radiographic analysis is a two-dimensional measurement of a process that occurs in three dimensions; the complex three-dimensional (3D) structure of the pelvic bone prevents its use in the periacetabular area. A more sensitive method to measure periacetabular osteolysis, therefore, needed to be developed. 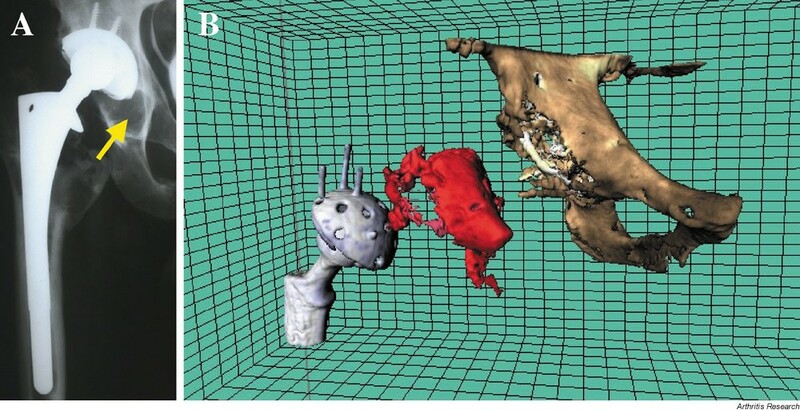 Computerized tomography (CT) image sets provide 3D data but the beam hardening artifacts from the prosthesis itself make these images difficult to interpret and use. To address the beam hardening artifacts, as well as to measure the volume of lytic lesions, we first developed an algorithm to diminish the effect of beam hardening artifacts. We then developed a segmentation algorithm to segment the lytic lesions from image data and to measure their volumes. In this study we have used these methods to evaluate whether polyethylene wear rate correlates with osteolytic lesion size [12,13]. Subjects were enrolled as part of a randomized, placebo-controlled, double-blind study of Enbrel® (Etanercept, Immunex Corp., Seattle, Washington, USA) for prosthetic hip loosening. (This study will be unblinded in March 2002). Patients with X-ray evidence of acetabular loosening on plain X-ray films were recruited from the clinical practice of the Department of Orthopedics at the University of Rochester (Rochester, NY, USA). Subjects that had an uncemented acetabular component, were ambulatory, and were at least five years post implant were eligible for this study. Exclusion criteria included inflammatory arthritis, history of prosthetic joint infection, current active infection, severe medical illness, chronic use of systemic glucocorticoids, use of calcitonin, and metabolic bone disease (except osteoporosis). Informed consent was obtained from all subjects. The Human Subjects Review Board of the University of Rochester approved this study. Plain X-rays and CT studies were performed on all patients. Two-dimensional analysis, based on anterior-posterior pelvis radiographs was performed as we have previously described [14,15]. With this technique, the mean volumetric wear accuracy is 4.88% ± 10.9% for two-dimensional volume. CT images were acquired using GE CTi with 1 mm collimation, a pitch of 1.5, and a 14–22 cm field of view. The raw data was reconstructed for 1 mm slices. The area within 5 cm from the prosthesis-bone interface in all directions was evaluated. The volume of osteolysis was calculated by VirtualScopics (Rochester, NY, USA). This volumetric CT measurement of osteolysis is accurate to 0.1 mm3 and it has a reproducibility of ± 4%. A beam artifact elimination algorithm is used to correct degradation of the CT images caused by the hip prosthe-sis. The algorithm suppresses streak artifacts and corrects the tissue density information for every voxel in the CT data. Once corrected, the CT data are segmented using a region-based algorithm. This algorithm automatically analyzes the image, finding cortical bone and metal based on density information and defining the boundaries between different tissues based on tissue contrast. The algorithm then proceeds to extract regions of uniform density, and labels each region according to its relative size. Regions are then combined using the segmentation algorithm that extends the largest regions of uniform density by merging them with contiguous, smaller regions of similar density. An expert radiologist then reclassifies the segmented regions. A region is labeled as lytic if no trabecular structures or cortical bone is seen in any of the orthogonal original CT images. The reclassified regions are then used for 3D rendering and volume measurements. Function was evaluated using the Harris Hip Scale, the Western Ontario and McMaster University Osteoarthritis Index (WOMAC), and the short form 36 questionnaire (SF-36). The Harris Hip Scale is widely used in the orthopedic literature to quantify the effects of hip surgery . It is a disease-specific index with validated reliability and responsiveness . WOMAC is a self-administered, disease-specific index widely used to evaluate both surgical and medical interventions in osteoarthritis of the knee and hip [18,19]. SF-36 is a self-administered questionnaire that assesses the overall quality of life. It appears to be generally applicable and has been used in a wide variety of clinical trials [20,21]. SPSS 10.0 for Windows was used to calculate the correlation between parameters. P < 0.05 was considered to be significant. Twenty patients, whose plain films indicated periacetabular osteolysis, were recruited from the outpatient practice of the Orthopedic Department at the University of Rochester (Rochester, NY, USA) (Table 1). The average age was 63.8 years and the average time post surgery was 10.8 years. All of the patients had THA with an uncemented acetabular component. Fifteen of the patients had THA for osteoarthritis and five had THA for idiopathic or post-traumatic avascular necrosis. None of the patients had inflammatory arthritis. There were 20 patients in this study (14 male and 6 female) with a mean age of 63.8 years (range 52–76). Nineteen patients were Caucasian, one African-American. The measurements were obtained at a mean of 10.8 years post-operation (range 5–14). For WOMAC (Western Ontario and McMaster University Osteoarthritis Index), a higher score indicates greater pain, stiffness, or difficulty. For the Harris Hip Scale, higher scores indicate better results. For SF-36 (short form 36 questionnaire) higher scores indicate better health. ADL, activities of daily living. Three-dimensional reconstruction and 3D-segmented CT measurement of osteolytic volume were obtained in all 20 patients. Figure 1 shows a comparison of plain film and 3D-CT images. In this series, where periacetabular osteolysis on plain films was a criteria for entry into the study, the volume of osteolysis averaged 30.0 mm3 and ranged from 2.9 to 92.7 mm3. We found that several subjects had lytic lesions that were readily identified by 3D-segmented CT scan, but were undetectable by plain X-rays. Interestingly, we also had one patient with an apparent large lytic lesion on plain films, but the 3D-segmented CT scan revealed a lesion that was only 2.9 cm3. In general, we thus found that plain films are a poor measure of periacetabular osteolysis. Plain film and 3D segmented CT of periacetabular osteolysis. The right hip of a patient with periacetabular osteolysis was imaged by plain film X-ray (A) and computerized tomography (CT) scan. The CT scan was analyzed using artifact suppression and 3D segmentation and then reconstructed by computer (B). The virtual reconstruction shows, separately, the femoral and acetabular components of the prosthesis and the pelvic bones. The reconstruction of the region of periprosthetic osteolysis is shown between these two structures. Polyethylene wear was determined using digitalized plain radiographs. In 15 subjects, films were obtained at least six months post-operation. For five additional subjects, wear volume was estimated assuming that the prosthesis was originally centered in the acetabulum. One subject had a Biomet prosthesis in which, by design, the femoral head is not centered in the cup. The average volume of wear was 1010 mm3 with a range of 72–2400 mm3. When CT measurements of osteolysis were correlated with the polyethylene wear for all 20 patients, osteolysis correlated directly with wear (RR = 0.494, P = 0.027). In two patients, however, the measurement of linear wear probably underestimated the amount of wear debris (see the two points indicated by the solid arrow in Fig. 2). One of these patients had an acetabular revision and thus may have had wear debris left over from the prior prothesis. The second patient had recurrent dislocation of the prosthesis and thus may have had wear debris that was not measured by our technique. If these two patients and the patient with the Biomet prosthesis (see clear arrow, Fig. 2) are excluded, the correlation between wear and osteolysis improves (RR = 0.685, P = 0.002). These data suggest that most patients have a fairly tight relationship between wear and osteolysis, but that there are outliers who have a relatively high amount of wear compared to the amount of osteolysis seen. These outliers, are enclosed by the rectangle in Fig. 2. Polyethylene wear versus periacetabular osteolysis for all 20 patients entered into the trial of Enbrel® for prosthetic hip loosening. The solid arrow shows two outliers: one had revision of a cemented acetabular component and the second had recurrent dislocations. The clear arrow shows the patient with the Biomet prosthesis. 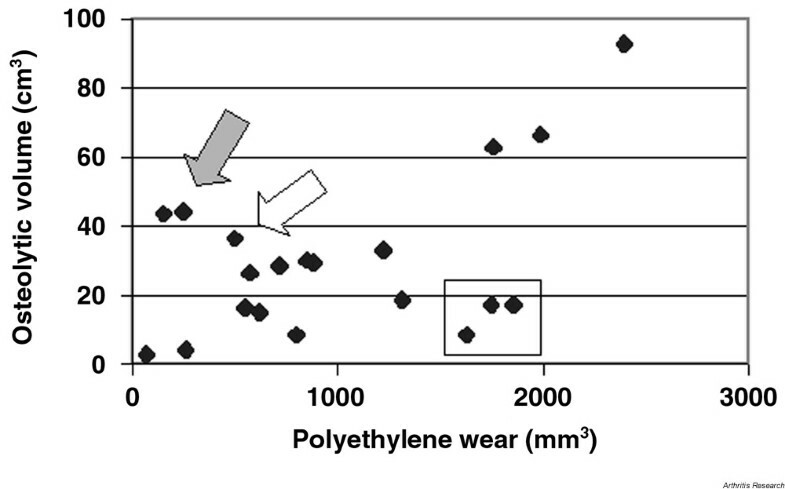 The rectangle shows outliers with low osteolysis relative to the amount of polyethylene wear. The Harris Hip score tended to correlate inversely with volumetric CT measurements of osteolysis, but this did not reach significance (RR=-0.418, P = 0.066). The WOMAC and SF-36 values tended to correlate well with each other and with the Harris Hip score, but their correlations with osteolysis were no better than that shown by the Harris Hip score. In this study we used 3D-segmented CT image analysis to determine the volume of periacetabular osteolysis in 20 patients with plain film evidence of periprosthetic bone loss. In a direct analysis of the relationship between polyethylene wear and osteolytic volume (with three patients excluded) we found a strong correlation (RR = 0.685, P = 0.002). Furthermore, this analysis readily identified the outliers. Of the patients with extensive osteolysis and little wear, one had received revision surgery to convert a cemented cup to an uncemented one, the other patient had suffered multiple dislocations. There were also patients that had extensive wear with relatively small oste-olytic lesions. One of these individuals had marked hypertrophic osteoarthritis, which was recently identified as a protective factor against osteolysis in a large retrospective series . We also found that osteolytic volume tended to correlate inversely with the Harris Hip Scale (RR=-0.418, P = 0.066), but this did not reach significance in this small series. These findings are important for several reasons. First, we have demonstrated that precise quantification of osteolysis and wear rate allows analysis of their relationship, despite a relatively small sample size (20 patients) compared to previous series with hundreds of patients [12,13]. The power of these measurements should, thus, allow identification of modifying factors. Second, by repeating these measurements over time we should be able to follow progression of osteolysis and determine the effectiveness of interventions designed to halt wear-particle-induced bone loss. Finally, we envision that 3D-segmented CT image analysis could be used to define the natural history of periprosthetic osteolysis and provide a guideline to when revision surgery is needed. Support for this project has been provided by Immunex Corp., Virtual-Scopics LLC, and research grants from the NIH, NIAMS AR45971 + AR46545 and the Orthopaedic Research and Education Foundation.